A champion of the modern movement and protégé of Bauhaus founder Walter Gropius, Marcel Breuer is equally celebrated for his achievements in architecture and furniture. Breuer was a student and subsequently a master carpenter at the Bauhaus in the early 1920s. His entire body of work, both architecture and furniture, embodies the driving Bauhaus objective to reconcile art and industry. While at the Bauhaus, Breuer revolutionized the modern interior with his tubular-steel furniture collection — inspired by bicycle construction and fabricated using the techniques of local plumbers. His first designs, including the Wassily, remain among the most identifiable icons of the modern furniture movement. Breuer’s attention eventually moved towards architecture. After practicing privately, he worked as a professor at Harvard’s School of Design under Walter Gropius. Breuer was honored as the first architect to have a solo exhibition at The Metropolitan Museum of Art. In 1963, Breuer began work on perhaps his best-known architectural project — the Whitney Museum of American Art in New York City. 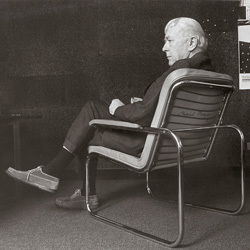 While Breuer never worked directly for Knoll, he is nonetheless an influential figure in the company’s history. He was an early mentor to Florence Knoll during her time in the office of Walter Gropius in the 1930s. It was also Breuer who suggested that Hans Knoll hire Eszter Haraszty, the Knoll Textiles director responsible for many of the Knoll Planning Unit’s most memorable color combinations. Breuer eventually sold his furniture collection to the Italian design company Gavina SpA. In large part it was the Breuer Collection that motivated Knoll to acquire Gavina in 1968. Along with The Wassily Chair, the collection included the Cesca side chair and Laccio table collection — both modern classics in their own right.